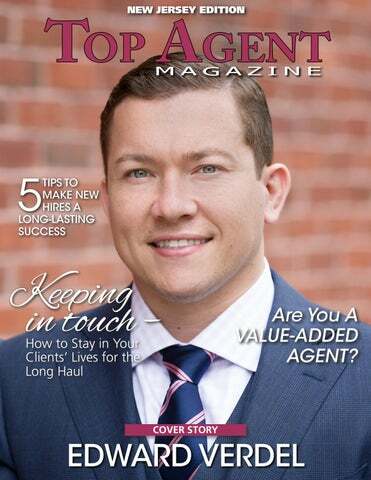 Are You A VALUE-ADDED AGENT? lines and zero clutter go a long way. A few well-chosen personal photos in tasteful, unassuming frames can provide a motivating connection to the world beyond the office, while accessories and supplies that are sleek, monochrome, and contemporary inspire a sense of calm efficiency. BUILD A WORKSPACE WITH YOUR DAILY ROUTINE IN MIND If you find yourself spending hours on the phone per day, or assembling stacks of documents and brochures, or even coming and going from the office with frequency—there are simple adjustments you can make to your workspace that will save you time and energy. If you sit for long hours—responding to e-mails or making calls—try incorporating an ergonomic chair or keyboard wrist-pad to maximize comfort. If you spend a long time assembling presentation materials, then file organizers, trays, and easy-to-pull labels can shave valuable time off your efforts. Lastly, those who step out for frequent meetings can reduce the hassle of being on-the-go by making your space mindfully organized—a coatrack and a dish for your keys by the door, an auto-brew coffeemaker, or an easily edited whiteboard calendar can make jet-setting simpler. ADD EASY DETAILS THAT ENRICH YOUR WORKING EXPERIENCE While organization and décor can rally productivity and mood, there are also a few extra details you can introduce to your workspace to improve the quality of your working life. Healthy, easy to grab-and-go snacks—think nuts, homemade trail mix, and fresh fruit— can keep your energy up without the sugar crush or guilt. If there’s a window nearby, a hard-to-kill plant like a philodendron or a fern not only cleanse the air around you, but also provide a welcome connection to the natural world. Being prepared in a pinch is another great way to make your workspace work for you: a spare tie, a tube of lip balm, hand sanitizer, or a box of Band-Aids can save you a trip to the store when an unexpected need arises. While we take great pains to make our homes our sanctuaries—complete with the decorations, furniture, and food we favor—we often overlook our work areas, even though we spend a sizable portion of our week sitting at the same desk. Challenge yourself to add a few of these personalizing, productivity-boosting details to your work area and bring the comfort of home to your working life. Are these exceptional services or average services? I’m writing this article at the beginning of a New Year. It’s a perfect time to re-assess your professionalism and master being that ‘value-added’ agent. the services they think the client values. However, there’s a real client out there, and the client has different expectations. How do I know that? 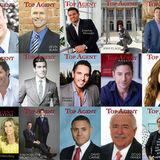 Because so few agents regularly survey their clients. In fact, when I’m speaking to an audience, I survey them, and find that less than 25 percent gather after-sale surveys! So, the majority of agents don’t know if the services they are providing are average or exceptional. Why Bother Being Exceptional? • Because you want to set yourself apart. • You want to create client loyalty. • You want to create at least 50 percent of your business from client referrals (the latest National Association of Realtors survey Profile of Members found that the average Realtor got only 18 percent of their business from referrals. That’s a hard and expensive way to run a real estate business! • Because you want to run a more pleasant, profitable business. ‘tell the truth attractively’, and work harder to retain the client than to make one commission. 3. Works for referrals, not just sales I said the agent learns to ‘tell the truth attractively’, even if the buyer or seller may not want to hear it. For example, if it’s in the best interests of the seller to list their home at a lower price, the value-added agent has the strategies and the statistics to prove that the seller won’t be well served by pricing higher. Of course, it’s not enough to actually take these actions. You need to explain to the client why these actions are in their best interests, and how you stand apart from most agents by employing them. Why? Because your client won’t know you run your business so professionally. And, the client probably doesn’t know most agents don’t run their businesses this way! And, this value-added agent has the intestinal fortitude to walk away if they know the home will not sell at the client’s desired price (but doesn’t have to too many times because they create a stellar reputation amongst their clientele). TIP: Always show your clients, don’t just tell them. You do have a Professional Portfolio and evidence on your website, don’t you? 4. Keeps the buyers and sellers’ best interests in mind Our value-added agent makes every decision to grow trust, not just to make a fast buck. For example, the agent sits down with a prospective couple and finds out they can’t purchase right away and creates a plan with them to save for their down payment. Then, the agent keeps in touch over a period of months, offering helpful information and market updates. How many of these actions P. S. Managers and team leaders—two tips do you exhibit? What do you want to work on to become a true 1. Call each of your agents’‘value-added’ phone mails. What’s the impre agent? Are they professional? Do they state the company n TIP: represent your culture and image? Managers, give your agents a 2. Create a quick class in phone messaging using the ‘test’ on these four points. In other words, this agent practices seller or buyHow many pass? this blog. er agency representation, not ‘agent agency’! To learn more about Edward Verdel email Ed@VerdelRealEstate.com, visit VerdelRealEstate.com, call (201) 679 – 7892, or visit his Facebook page here. www. ing a good match for the long haul requires more than just assessments of skill and personality. To ensure a talented new hire sticks around and is truly positioned for success, the onboarding process must be executed with the same care applied during hiring. For a few ideas on how to make the most of the onboarding process, consider the tenets below as you guide your new hire toward long-lasting success within your company. 1. Be honest about the scope of the role Let’s say you’re looking to add a new buyers agent or loan processor to your team. You write up the position’s responsibilities, but neglect to mention that you want the new hire to handle a host of administrative tasks, as well. Maybe it doesn’t seem important enough to outline in detail, as it’s the sort of thing the rest of your does. Miscommunications like these are a leading reason why new hires leave their roles. If there isn’t clarity and transparency about a position’s true responsibilities, then new hires may become quickly disillusioned and seek out greener pastures. 2. Build in some perks While stocking the breakroom with bagels every Friday may seem like a small gesture, it’s often those little morale-boosting moves that build loyalty and comradery among the team. Bike-to-work incentives, subsidized gym memberships, and benefits that match the needs of your employees—all are ways to demonstrate appreciation and investment in your team. Likewise, the right candidate will return the favor and invest his or her energies into their new role. expectations when asking these questions, but use it as an opportunity to gage a candidate’s seriousness about the real estate or mortgage industry. Why this line of work over another? Emphasizing industry longevity and career growth during the interview process can save you drama down the road. 4. Keep the lines of communication open Take a proactive approach in communicating with your new hire. Take time to check in regularly during the first six months of his or her addition. If you can, make time to train new hires yourself—if only for a part of the onboarding process. You’ll forge a deeper professional bond and create an avenue for further questions. All in all, make it clear that you’re personally invested in their presence and talents, and that you care what they have to say. That way, if any issues or doubts arise, you can stay on top of it and work out a solution, rather than lose a new employee. 5. Give new hires meaningful work to do It’s natural to keep the kid-gloves on with new hires, but don’t let that stop you from giving them a chance to shine. New team members will feel empowered and motivated if given meaningful projects to focus on. Don’t relegate their daily duties to busy work as they build experience. Instead, task new teammates with something challenging, or that draws on a specific skill you hired them for. You’ll instill confidence, demonstrate your commitment to their growth, and with any luck—keep them around for the long haul.